You know that your little one is growing when…. … her first tooth starts loosening! We are exactly in that moment of our lives when one of her teeth started to move, we went to the dentist and she said to alert the Tooth Fairy… so this is what we did! This is really easy, can be made in less than an hour… and it won’t cost you anything, since it repurposes preloved materials! 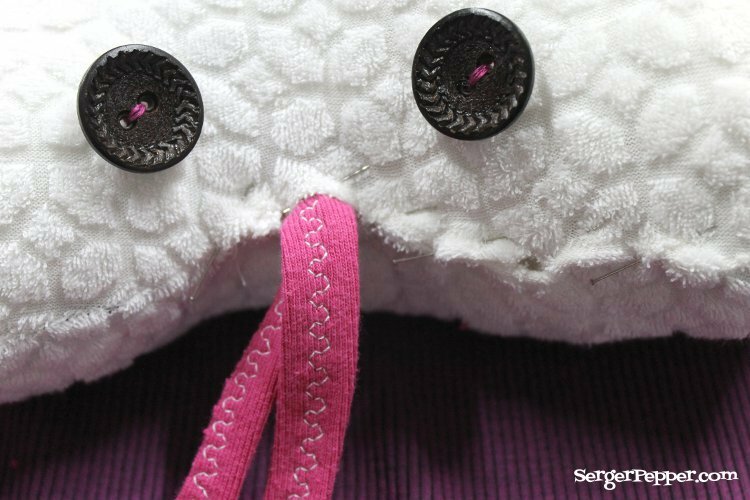 Sew all around the mouth with a short stitch length (2 is perfect in my book), just a mm or 1/64″ on each side. Slide your scissors’ points between the two seams and open that smile! Better pin it and press it to secure it in place! Turn the tights inside out and take another piece of fabric (this time in red), same measurements as the white one. Lay it above the other one, aligning the edges; put it right side down, toward the inside of the mouth. This is optional, but I really loved the oddity of a tooth with a tooth…! Just take a piece of muslin, fold in half and sew all around with a U shape (mine was roughly 6 cm or 2 1/2″ long by 2.5 cm or 1″ wide). 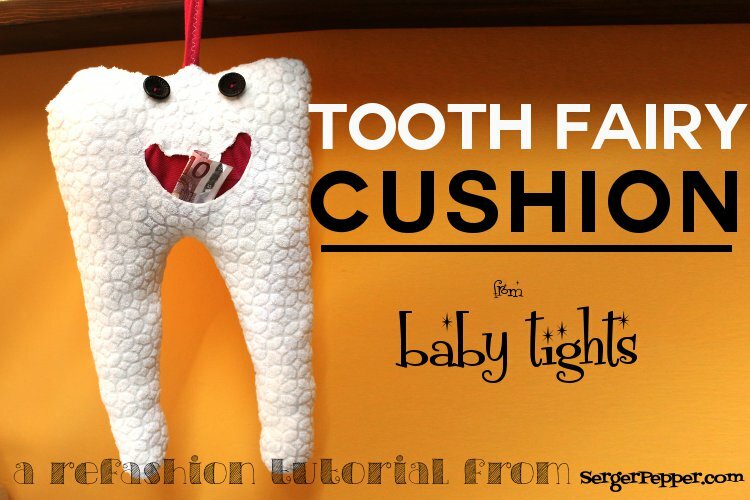 Press, trim seam allowances and turn inside out, then press again: here’s your tooth! It’s time to put it in place. I liked how it looked slightly off-centered. We’re going to stitch it in place while topstitching all around the lips! 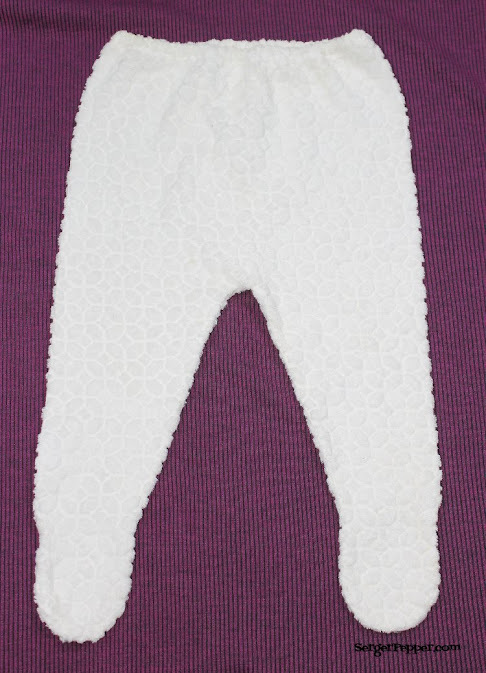 As you can see, my baby tights were cut off-grain… so when I went to chopping off their upper edge (the waist elastic) it ended up being off-centered… maybe you have better tights to use! For the shape… just go and eyeball it, you need to give the illusion of a tooth enamel crown! We’re nearly done! Choose two buttons for the eyes. I thought those, coming from an old coat my dad had in the 70s, were pretty good. I chose violet thread to match with the mouth and the hanging string loop (coming soon). To be sure they’re not coming off in no time, I added a muslin, folded in four, to the wrong side of the tights, then sewn the button above it… this should ensure more strength! One more time, turn inside out your hybrid half tights/ half tooth and stitch the upper edge closed, leaving a gap in the middle to be able to add the filling, later. Las time, promised! 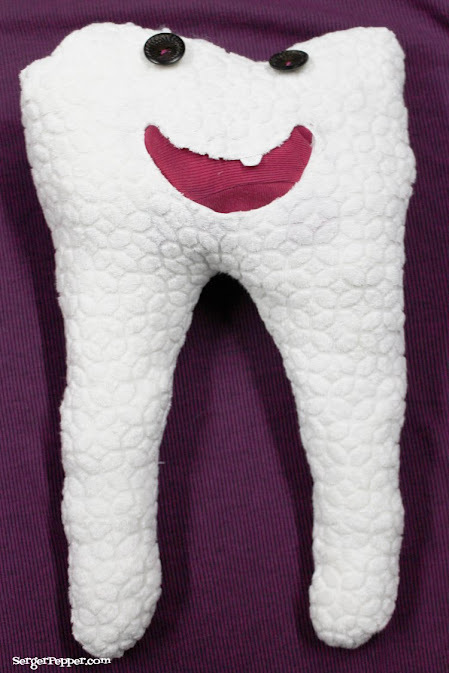 Turn inside out and look at it… is it starting to seem a tooth, isn’t it? 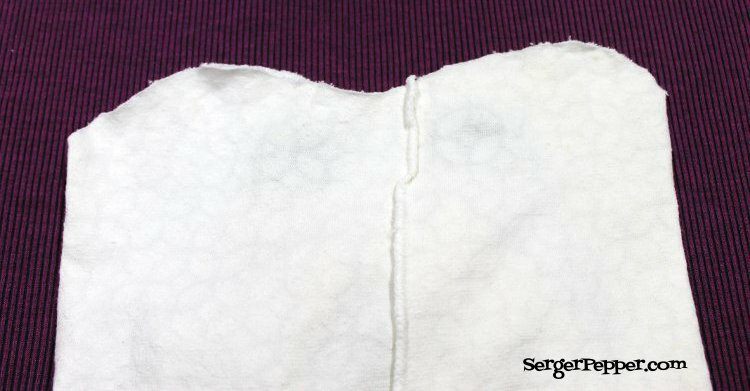 Fill it with cushion wadding, taking your time to be sure you’re pressing it enough. Last effort: the hanging loop! 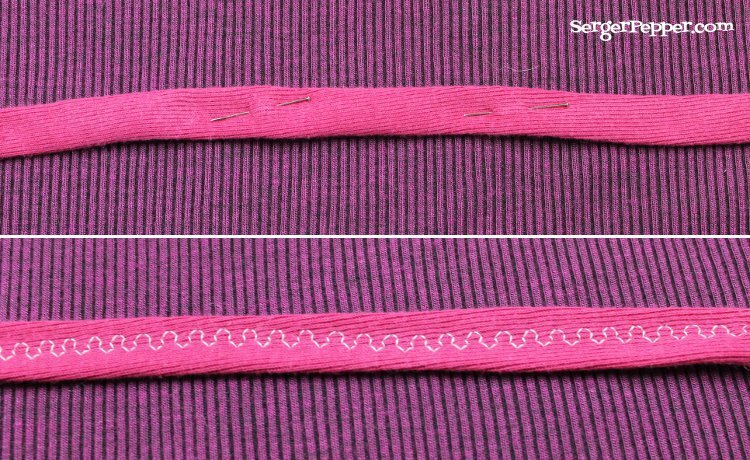 Using the same fuchsia fabric you used for the mouth, cut a strip roughly 5 cm or 2″ by 40 cm or 15″; fold in half widthwise and press. Fold long sides to the center, again, hiding all the raw edges. Press again and stitch along the center (honeycomb stitch for me, decorative and stretchy!). This will be the string that will be used to hang your tooth fairy cushion to your kids door (or closet, or wherever you like to hang it), hence it need to be fold in half and secured to the tooth, just where we left the gap for filling it. Pin it in the middle and pin closed the rest of the gap to. Slipstitch by hand with matching thread: nobody will notice it! For added strength, I’d suggest you to stitch more times throught the base of the loop string. but I’m pretty sure my daughter’s Tooth Fairy will be more inclined to leave a € 2 coin! And your Tooth Fairy, how much is she spendthrift? & be notified about new posts!